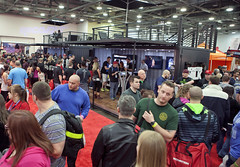 The Arnold Sports Festival is the largest multi-sport event in the nation welcoming 175,000 fitness enthusiasts and 18,000 athletes competing in over 45 sports and events. 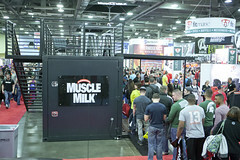 Among 700 booths, leading nutritional supplement manufacturer CytoSport needed a space to wow their consumers and showcase their most popular fitness brands, Muscle Milk and Monster Milk. Working in collaboration with CytoSport, we took note of their philosophy and trimmed the fat in our design. Using lighter materials coupled with new design methods, we built some of the lightest and most structurally advanced units to date. 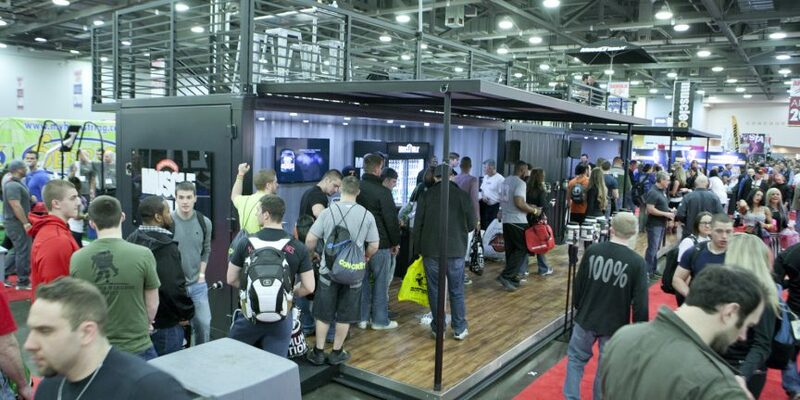 The Muscle Milk and Monster Milk booths were made up of two purpose-built 20-foot containers, and one 10-footer. Starting with a modified half-suite design, we incorporated two VIP upper decks, a full smoothie bar complete with refrigeration and running water, and televisions and iPads where show attendees could interact and learn more about the brand’s nutritional products. 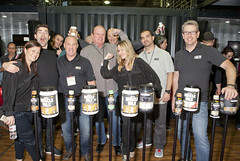 To ease transport and storage issues, we incorporated a 10-foot container that bridged the gap between the Muscle Milk and Monster Milk spaces, while simultaneously acting as a discreet storage space. This build also marks the first time that we’ve used an alternative material for our awnings instead of a fabric. 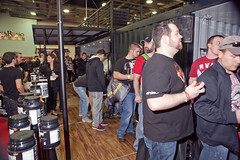 Towering over the other product showcases, athletes and fitness nuts throughout the Arnold Classic flocked to the Muscle Milk and Monster Milk booth, spotting the sleek, all black, fully-branded container space from across the trade show floor. Once their guests had the chance to learn more about CytoSport’s products and sign up to receive custom nutritional plans created by pro-athletes, they could then visit the smoothie bar where they got to check out the various supplements first-hand with their choice of protein, fruit, and other ingredients. 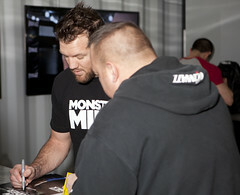 Over the course of the Festival, celebrity appearances by MMA Light Heavyweight Ryan Bader, and MMA Middleweight Champion Chris Weidman were made to meet and sign autographs. 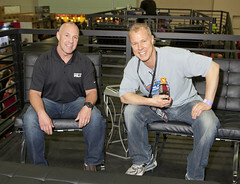 Overall the CytoSport experience was a knockout, and we can’t wait for the next stop, so be sure to follow us on Twitter to learn more. In the meantime, check out the pictures of the event below and see the full gallery at our Flickr page. 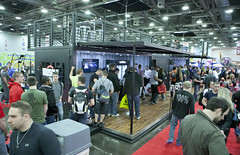 And if you are looking to create an undisputed brand experience for your fans, give us a call.